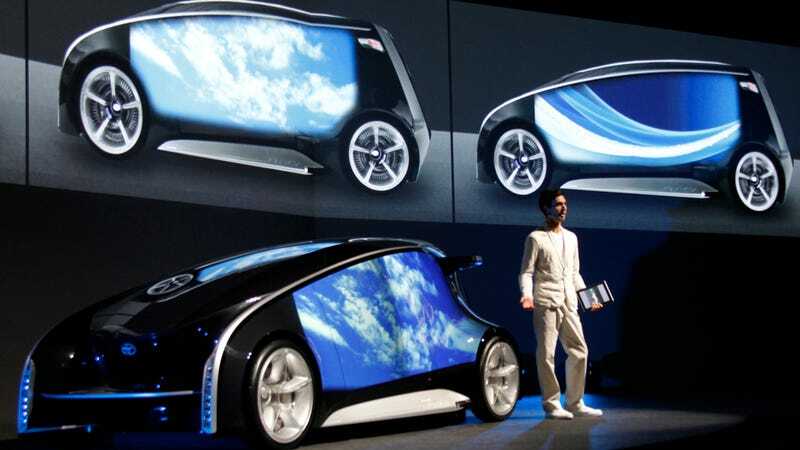 Meet the Toyota Fun-Vii, a futuristic concept car that Toyota's president described as "a smartphone on four-wheels." Smartphone screens have certainly been growing, from 3.5-inches, to 4-inches, to 4.5-inches but holy crap, is this the logical conclusion? Toyota's concept of the future is a whimsical one, where people would get out of their cars and use the giant touch screen to do some internetting. Also, do you know how expensive body work already is when someone side-swipes your parked car? Now imagine adding the cost of a gigantic, curved, back-lit touchscreen. Kill me now. Maybe you could subsidize the cost by making the side of your car into a mobile billboard.